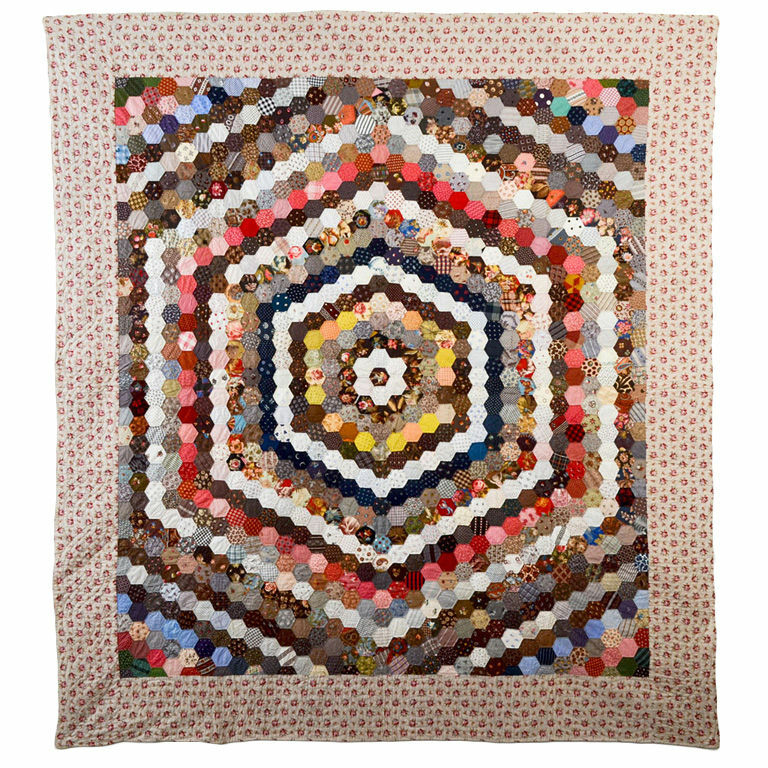 I'm revisiting the quilt featured in the Cupids in quilts valentine's day post. Here is the center with a great bird from a cheater cloth/printed patchwork crazy quilt fabric (the fabric was used many times in the quilt). And if you look closely you'll find a centennial 1876 flag print (don't forget to click on photos to enlarge them). 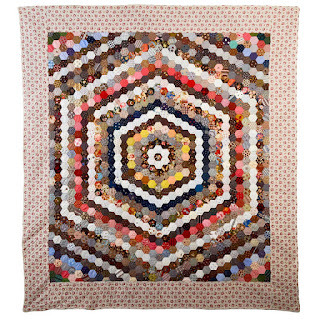 Here is the full quilt, love the graphic nature of hexagon medallions with careful color placement and this is a real triumph of both art and workmanship. 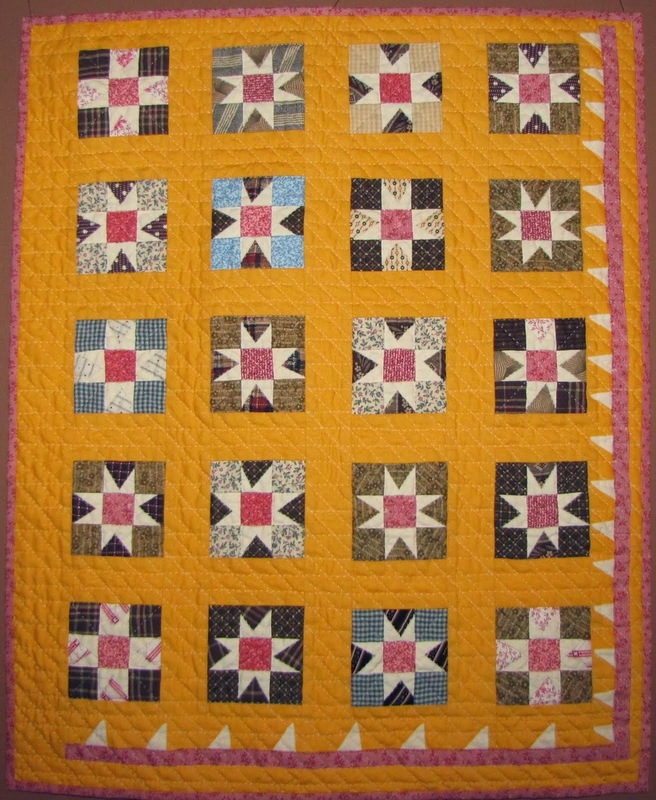 Circa 1880 in the charm style although with repeats (mostly fussy cut from different parts of novelty/cheater cloth fabrics). It has lots of wonderful unusual novelty prints and I'll share a few in this posting. 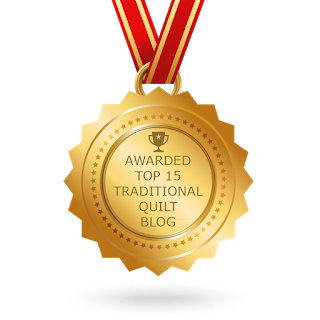 You can scroll down to the prior post or click on the link above to see the cupid fabrics. Probably the most important fabric in the quilt is this dated centennial print from 1876 with 1776- 1876, the Liberty bell and the names of the original colonies. 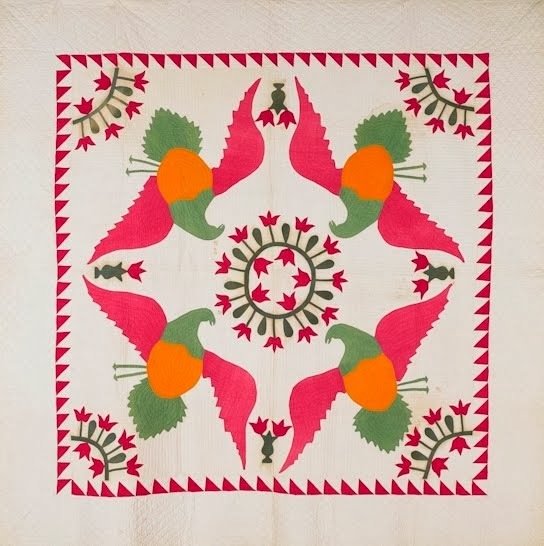 Next we find this charming couple and another bird and on the middle of the bottom row another printed patchwork print (see how it looks like a piece of sewn patchwork). 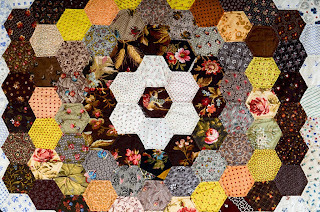 The 1880's were the heyday for such fabrics. Next we find another person in a lovely striped outfit and a simulated needlepoint flower and look closely, that flower is from a printed patchwork imitation crazy quilt fabric. 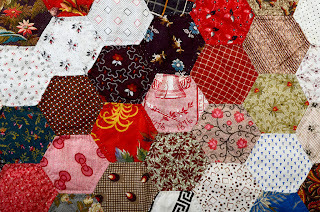 In honor of St. Valentine's Day, I went on a search for cupids and hearts/arrows in my antique quilt collection. Here is the best cupid fabric ever ... The Cupid-Seller or Love Merchant, a toile de Jouy, from Jouy France, Oberkampf fabric company, from 1817. Look at the amazing detail. And here are a couple of cupids from a circa 1880 hexagon medallion quilt (also has centennial fabrics).